This week was about as good of a week as the Mountain West can expect to have. Not only did member institutions glide through the MWC/MVC Challenge on their way to an 8-1 victory, but of the 18 games played involving MWC teams this week, the MWC posted a 16-2 record, with only a hard-fought TCU loss to Northern Iowa and an entirely predictable embarrassing Wyoming loss to South Dakota on the negative side of the ledger. As a whole, the conference boasts three remaining undefeated teams (San Diego State, UNLV and BYU – all three ranked in our RTC top 25), three other teams with a lone loss and a composite 53-13 record. Last year at this time, New Mexico, UNLV and BYU had earned a combined 21-1 record and had separated themselves from the rest of the conference as the teams to beat, and this season, a similar separation has occurred. But last year, after a relatively slow start to the season, San Diego State came on strong down the stretch, winning nine of their last ten games (including the MWC Championship) before bowing out in the first round of the NCAA Tournament. This year’s version of the Aztecs, a team that is capable of improving drastically over the back end of the season could be last year’s regular season champion, New Mexico, a team who is just now starting to get some of their newcomers comfortable and who still awaits the midseason addition of transfer Drew Gordon. The rest of the conference is still sorting itself out, but while there are hiccups here and there, the conference as a whole appears stronger than last year’s very strong performance. Team of the Week: Air Force – A couple weeks back, as the Falcons were losing to Division III’s Colorado College, I would have put the odds of Air Force ever occupying this space in 2010-11 as absurdly slim. But, these days, the Falcons are on a four-game winning streak, and while they haven’t exactly beaten up on the Dukes and Georgetowns of the world, wins over Wofford (the Falcons first road victory in almost two years), CS Northridge and Evansville (a team that already beat Butler this season) are good wins for a team that finished 9-20 a year ago. This week, the Academy got solid contributions from up and down their roster, but special attention should be paid to sophomore center Taylor Broekhuis who averaged 15.5 points per game this week and knocked down five threes as the Falcons edged Evansville on a free throw by fellow sophomore Mike Lyons in the waning moments of their game on Sunday. While not the most athletic team and prone to getting killed on the boards on both ends of the floor, Air Force has outdueled their opposition by taking care of the ball and playing great defense, limiting opposing teams to just 34.8% shooting from the field. While still not a huge threat against the upper echelon teams in the conference, head coach Jeff Reynolds has at least shown that after hitting rock bottom, this team is at least moving in the right direction again. Player of the Week: Andy Ogide, Colorado State – Ogide posted his eighth and ninth double-doubles of his career this week in leading his Rams to a pair of wins over Drake and Fresno State, while averaging 17 points and 10.5 rebounds. CSU was in need of some serious toughness and veteran leadership after a disturbing loss to Sam Houston State on 11/27, in which they were outrebounded and outhustled throughout, and the senior responded, hitting 15 of his 22 shots and controlling the paint for the Rams, opening up the perimeter for CSU’s talented shooters to knock down 18 of their 37 three-point attempts on the week. For the Rams to compete for the post-season berth that they dream of, they’ll need Ogide to match these types of efforts the rest of the way. Newcomer of the Week: Josh Watkins, Utah – On the heels of Utah’s Will Clyburn winning this award the first two weeks out, it is time for a little variety, in the form of another Utah junior college transfer. Watkins and Clyburn have been the dynamic duo early for the Utes this year as they have run out to a 5-2 record. Watkins, a 6’0 junior point guard, is second on the team in scoring, averaging 17 points a night, and this week, he became the first Ute besides Clyburn to lead the team in scoring for a game when he tossed in a career-high 23 points (including three three-pointers) as the Utes went to Peoria and knocked off Bradley. Watkins is the only UU player with double-digit assists on the season (he is averaged 3.5 assists a game), but he has two more turnovers on the season than assists. While Watkins has given the Utes a good scoring punch in the backcourt, he’ll need to tighten up his handle and work on dropping more dimes for his teammates than for his opponents, but for now, his contribution to his team is definitely more positive than negative. Game of the Week: Air Force 57, Evansville 56 – The Falcons posted their fourth win in a row and wrapped up a dominating performance by the Mountain West in the MWC/MVC Challenge with this AFA win over Evansville on Sunday, but it didn’t come easy as the teams combined for just 19 points in the final ten minutes of the game. Falcon sophomore center Taylor Broekhuis put Air Force up 56-53 with his fifth three of the game, just under two minutes, but was answered immediately following an Aces timeout by sophomore Colt Ryan fifth three of the game as well, tying things back up. Following an Air Force turnover, the Falcons inability to secure a defensive rebound forced them to play defense for almost 70 seconds, but Evansville junior Denver Holmes missed an open jumper that was secured by Falcon senior Derek Brooks, who immediately turned upcourt and fired an outlet pass to sophomore Mike Lyons who raced upcourt and attacked the basket, drawing a foul at the rim. He made just the first of two free throws but that accounted for the Falcon win. Game of the Upcoming Week: UNLV at Louisville, 12/11, 9 AM PST, ESPNU. – There are quite a few very interesting games this week around the Mountain West, with each of the three remaining undefeated teams having one big battle on their hands at some point, but we’ll give this one the nod as perhaps the biggest challenge of the week. Not only do the Running Rebels have to travel to Louisville and their new arena, but the Cardinals will have some revenge on their mind after UNLV squeaked one out over Rick Pitino’s gang last season at the Thomas and Mack Center. To make matters worse, the Rebels will have to fly east and play this game bright and early on Saturday morning. And, given the old adage that pressing teams hate to be pressed, we’ll see which of these teams, both of whom rely on defensive pressure as a key component in their success, will wither under defensive duress. 1. San Diego State (8-0): After spending the first two weeks of the season on the road, the Aztecs have now had a chance to spend the last two weeks at Viejas Arena, and a little home-cooking looks awful good on them. With two big tests rolling through town this week, in the form of St. Mary’s and Wichita State, and with both tests passed with flying colors, Aztec fans are starting to believe that this is a special team, loaded with tons of talent and veteran leadership. If one wasn’t aware of this already, they need look no further than a spectacular 14-0 run in the span of 67 seconds in SDSU’s win over Wichita State on Saturday, where the Aztecs forced turnovers, got out on the break and converted two three-point plays, one four-point play (following a WSU intentional foul) and a couple other field goals, in blowing the game open as part of a larger 21-3 run that turned a one-point deficit into a 17-point lead in the blink of an eye. Malcom Thomas had a big week for the Aztecs (12 PPG, 5.5 RPG and 5 BPG), but head coach Steve Fisher is getting contributions from up and down his roster, with six players presently averaging over eight points per game. A Look Ahead: One of the last big tests in the non-conference for the Aztecs comes up on Wednesday night when they travel to Berkeley to face Cal. While Cal has famously struggled scoring the ball early this season, they did already hang a 25-point loss on SDSU’s MWC rival, New Mexico, so the Aztecs should come into that game ready. On Saturday, they’ll return home to face cross-town rival San Diego, a program that is currently a shell of its former self. In all likelihood, if the Aztecs can get through Cal, they’re looking at a 15-0 record heading into conference play in January, with only a 12/18 matchup with UC Santa Barbara even remotely scary the rest of the way in the non-conference docket. 2. UNLV (8-0): The Rebels backed up their 76 Classic victory with a couple good road wins this week, a 31-point crushing of Illinois State in the MWC/MVC Challenge, and then a 12-point win over in-state rival Nevada in Reno in Saturday night, and now boast an 8-0 record for the first time since the famed 1990-91 Running Rebel team. Junior point Oscar Bellfield led the Rebs this week with 17.5 points per night and eight total threes, but six players scored in double figures at some point this week, and this Rebels fairly coasted through a tough set of road games. In the Nevada game, UNLV didn’t allow a field goal for most of the first 11 minutes of the game and led 22-2 before the Wolfpack eventually got on the board on the way to a 46-25 halftime lead before Lon Kruger’s bunch lost some focus in the second half. A Look Ahead: Boise State visits Vegas on Wednesday before the Rebs head to Louisville on Saturday for a tough early-morning matchup with the Cardinals. 3. BYU (8-0): Here’s how strong the top of the MWC is: the Cougars didn’t play a home game this week (technically, at least – they did play in Salt Lake City against Hawai’i which is close enough for government work), still posted a couple more wins by an average of 16.5 points, and still drop a step in my rankings. To defend that decision, I would just say that the two teams above BYU seem to have their rotation and roles more firmly set than the Cougars do, although head coach Dave Rose seems to get more and more answers each week as the season rolls on. This week alone, four different Cougars posted career-highs in points, with sophomore forward Brandon Davies going for 24 points (with a side of six rebounds to boot) and freshman guard Kyle Collinsworth adding 12 points (and ten rebounds – that a career high as well) in a 12-point win over Creighton in Omaha, before freshman Stephen Rogers went for 12 and senior forward Logan Magnusson added ten against Hawai’i. Sophomore Chris Collinsworth missed both games this week due to an ankle injury, and he remains day-to-day. A Look Ahead: An eventful week for BYU, as they head to Glens Falls, New York to face Vermont in a homecoming game for senior guard Jimmer Fredette, before heading back to Salt Lake City for a big-league matchup with Arizona. After the hullabaloo of the trip to Glens Falls and its attendant demands on Fredette, the follow-up game with the Wildcats is even more of a test as the young and inconsistent Cougar front line will have to deal with Arizona’s All-American type forward, Derrick Williams. 4. New Mexico (6-1): A couple games, a couple wins, as the Lobos start to fold in their newcomers with the battle-tested veterans of last season’s conference champions. This week, sophomore forward Emmanuel Negedu made his first major contributions for his new school with his 11-point, eight-rebound performance in a mere night minutes during UNM’s win over Southern Illinois. In doing so, he earned more minutes in the Lobos next game, 23 to be exact at New Mexico State, and while the scoring and rebounding numbers were down some, he did reject three Aggie shots. Elsewhere, Phillip McDonald is working his way back from an early-season elbow injury, and has added a presence on the glass that was absent in his first two years in Albuquerque, pulling down 19 rebounds this week, while also going for 14.5 points per night and adding five threes this week. Then there’s freshman guard Kendall Williams, who has averaged over ten points a game for Steve Alford and dropped a career-high 17 points, including three more threes (he’s now 11-19 from deep on the season) in the New Mexico State game. With senior point guard Dairese Gary still plugging along as his usual excellent self, this Lobo team has the potential to grow into a very tough out by March. A Look Ahead: The second half of the battle of the Land of Enchantment, as the Aggies repay New Mexico with a visit into the Pit. Beyond that, it’s study hall for the Lobos. 5. Colorado State (4-1): As we mentioned above, the Rams were in major need of a bounce-back performance following a disappointing loss to Sam Houston State, and bounce back they did with two good wins over Drake and Fresno State. While we named Andy Ogide as our MWC player of the week, he got plenty of help from his teammates this week. In particular, senior Andre McFarland averaged 14.5 points per game and knocked down seven of the Rams’ 18 three-pointers on the week, while sophomore transfer Wes Eikmeier added 11 assists. But, by and large, this CSU squad has been a deep team getting production from all over, with ten players averaging at least ten minutes a game and eight players having scored in double digits this season. There isn’t a ton of big talent on this squad, so Tim Miles will need to keep his team alert to the need to rebound and defend the interior as a team, but if the Rams keep hitting from the field at a rate anywhere near what they’ve been doing so far (their 60% effective field goal percentage is good for fourth in the nation), they’ll have a bombers chance against anybody. A Look Ahead: The Rams get a taste of life in the Big 12 this week, as they travel to Boulder for a winnable game against Colorado before they get brought back down to earth in Kansas City with a neutral-site matchup with Kansas. 6. Utah (5-2):The Utes got through a pretty tough week unscathed, knocking off Fresno State at home and following that up with an impressive road victory at Bradley. Junior college transfers Will Clyburn (20 PPG this week) and Josh Watkins (19.5 PPG this week) continue to lead the way for head coach Jim Boylen, but the Utes also got a big boost from another JuCo transfer, Chris Kupets, who had a career-high 17 points in the Fresno win. Good news on the injury front for the Utes as well as junior center David Foster started against Bradley and got his first start of the season while playing 20 minutes, and senior Jay Watkins’ back continues to improve. A Look Ahead: Utah’s schedule continues to be a good match for their skill level: lots of games against middle-of-the-road competition, very few cupcakes, very few killers. This continues this week with a home game against Pepperdine and a road trip to Ann Arbor to face the Wolverines. Both of these games are good tests for the Utes, with the Michigan game, in particular, a game that they’ll need to play their best to win. A Look Ahead: It’s a Big 12 road trip around the MWC, with TCU joining CSU in a little MWC/Big 12 mini-challenge. The Horned Frogs have a little bit more manageable pair of games, however, with trips to Texas Tech and Nebraska on the slate – games that, while tough, are winnable. 8. Air Force (5-1): We’ve said just about everything that needs to be said about the Falcons in our Team of the Week and Game of the Week sections above, and there are lots of good things to be said about this team right now, but let’s just remember that while this is a team that is going to play hard night in and night out throughout the season and defend like crazy, there isn’t a lot of firepower on this team. When they’re in a game with a team that isn’t going to blow them away with athleticism (see Evansville), they are capable of sticking around just through shooting and defending like crazy, and when they are in a game with a wilder team that is looser with the ball (see CS Northridge), they can take advantage and outsmart their opponents. But, as they get into conference play and start seeing a higher level of athleticism and of basketball smarts, we will likely be reminded that this is a relatively unathletic bunch without much in the way of consistent playmakers. For now though, just enjoy the ride. A Look Ahead: A very tough roadie on Wednesday with a trip to Dayton to face Wright State. This is the type of team that should give the Falcons a lot of trouble, and as such, this will be a good litmus test to see how far Air Force has come. Luckily enough, the Falcons follow that up with a visit by North Carolina Central to Colorado Springs. 9. Wyoming (3-5): The good news: the Cowboys held up their end of the deal by knocking off Indiana State in the MWC/MVC Challenge behind five players scoring in double figures. Wyoming held the Sycamores to 29.4% shooting from the field and forced 22 turnovers while only committing eight themselves. Of course, the bad news is that three days prior, the Cowboys made a weird road trip to Vermillion, South Dakota for a matchup with the Coyotes in front of 1,768 fans in the DakotaDome and got completely outshot in the second half, hitting just 37.5% from the field while their opponent knocked down 52.2%. Desmar Jackson led the Cowboys with 15.5 points a night for a team that is just a mess right now, failing to live up to their talent on a regular basis. A Look Ahead: A Friday trip to UC Irvine for the Cowboys, a game that should be completely winnable, but given the state of this program, is probably a coin flip at best. Some folks may be going through college basketball withdrawal today as the Thanksgiving tournaments have ended and the action is extremely light tonight. Fear not however, great games make a comeback tomorrow. All rankings from RTC and all times eastern. Minnesota is still riding high after their tournament win in Puerto Rico as they open the ACC-Big Ten Challenge against the Virginia Cavaliers this evening. The Golden Gophers are dealing with some injuries tonight as starting point guard Al Nolen (foot) and Rodney Williams (ankle) are unlikely to play. Coach Tubby Smith still has plenty of weapons to turn to and may get Devoe Joseph back from suspension tonight. Smith has said he’s undecided but there’s a chance that Joseph could make his first appearance of the season against Virginia. The Cavaliers went 1-2 in Maui, defeating Oklahoma while losing to Washington and Wichita State. They’re 3-3 overall and are expected to finish near the bottom of the ACC this season. Tony Bennett’s team has been, well, unlike a typical Tony Bennett team so far. Virginia has struggled on the defensive end, ranking #135 in efficiency. They’ve given up an average of 70 PPG and are #330 in defensive effective FG%. UVA doesn’t force turnovers due to Bennett’s deliberate, slow pace and have been terrible at defending the three. Virginia is almost dead last in defensive three point percentage, allowing opponents to shoot 47% from behind the arc. As you might expect, Virginia’s opponents get the largest percentage of their points from the three point line, #1 in the nation. To put this in perspective, Bennett’s last team at Washington State (2008-09) finished #6 in the country in defensive efficiency. 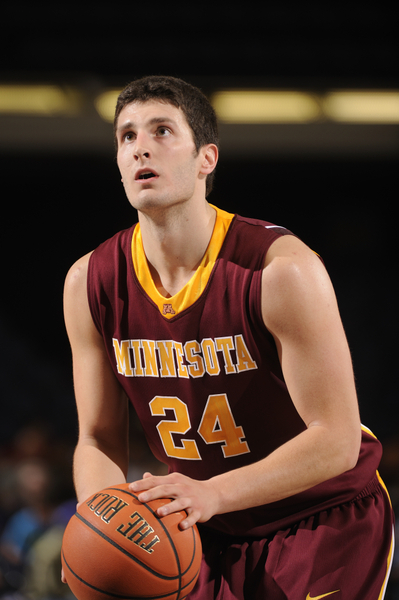 Minnesota will look to take advantage of this weakness with Blake Hoffarber, who broke out of his early slump with 24 points on 10-16 shooting against North Dakota State on Wednesday. With Nolen out and the status of Joseph still up in the air, Hoffarber is more than capable of running the offense (2.82 assist/turnover ratio). The Gophers should dominate this game in the low post with plenty of scoring and good rebounding behind Trevor Mbakwe (14/9, 69% FG) and Ralph Sampson III (13/7, 3 blocks), but Virginia has a star of its own in 6’8 Mike Scott. The senior forward is averaging 17/9, Virginia’s only player in double figures so far this season. He’ll have his hands full with Minnesota’s stellar frontcourt but the Cavaliers are counting on him to keep them competitive tonight. 6’9 Will Sherrill can stretch the defense and he’ll need to do a lot of that by pulling Mbakwe and Colton Iverson away from the basket where they can’t get into a comfort zone. Minnesota may struggle a bit to start the game with the uncertainty of their rotation but expect a steady diet of Hoffarber from deep along with dishes to Mbakwe and Sampson III. That will allow Minnesota to pull away and win this one comfortably. This clash between Pac-10 and Mountain West schools features a USC team coming off a bad loss at Nebraska on Saturday and a TCU club playing second fiddle to the school’s football team in the hunt for a BCS national championship. Expect this to be a low scoring game as both teams struggle offensively, each ranking outside the top 100 in offensive efficiency. The Trojans are a much better defensive club, though you wouldn’t know it based on their performance against Nebraska (50% FG for the Cornhuskers). USC still ranks #29 in defensive efficiency and #7 in opponents’ offensive rebounding percentage, essentially controlling the defensive glass. Kevin O’Neill has two totally different players leading the team with his 5’7 point guard Maurice Jones (13/4/4) and 6’10 F/C Nikola Vucevic (16/11), each having a great start to the season. As you might imagine, Jones struggles shooting the trey due to his height. He still finds a way to score and get others involved making the freshman a nice piece to build around in the coming years. Vucevic is an experienced junior who teams with Alex Stepheson to create a better than average frontcourt. Stepheson, a transfer from North Carolina, had 14/9 against Nebraska and is shooting 56% from the floor this year. The Horned Frogs of TCU are led by another small point guard, 5’9 Hank Thorns. He’s averaging seven assists per game while grabbing four rebounds, pretty good for a guard of his height. TCU’s leading scorer is Ronnie Moss (16 PPG), a threat from behind the arc against a Trojan defense that ranks #237 against the trey. It’s been a struggle for TCU when it comes to rebounding the basketball as they’re really undersized. They’ve been outrebounded in all but two of their games, averaging only 31 RPG. TCU is #300 in offensive rebound percentage and #293 in two point percentage defense. Put those two stats together and you have a recipe ripe for putbacks for scores off missed shots. USC will look to take advantage of that behind Stepheson and Vucevic. The Trojans should get the ball inside early and often to utilize their size and rebounding strength in this matchup. The Trojans must get to the free throw line more often as they rank poorly in that area and only attempted two free throws against Nebraska. A more aggressive style would cure this problem but with a very slow tempo (#262), don’t expect that to change anytime soon. Well played games from Moss, Thorns or J.R. Cadot will keep TCU in this game to the end. USC is the better team but the Horned Frogs are at home so we see this as a toss-up game that may come down to the last few possessions. Andrew Murawa is the RTC correspondent for the MWC and Pac-10 conferences. The start of the 2010-11 season has been just about everything the Mountain West commissioner’s office could hope for after a tumultuous offseason. After almost two weeks of play, five MWC teams remain undefeated and the nine conference teams have posted a combined 25-6 record with the four biggest contenders for postseason berths a combined 13-1, a New Mexico loss at Cal the only blemish. San Diego State – The Aztecs have been busy thus far, posting an early 5-0 record including four wins in the CBE Classic. 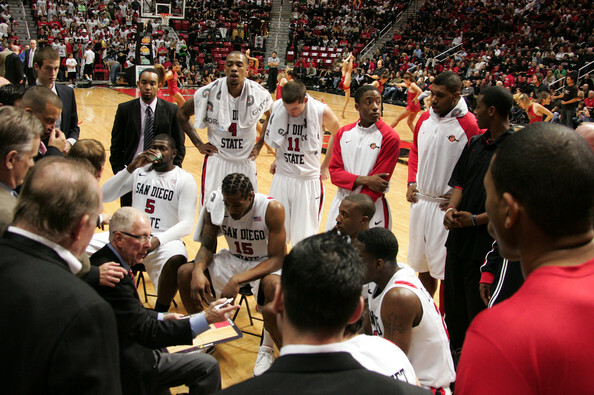 The highest profile win for Steve Fisher’s squad was a road victory over Gonzaga during the ESPN College Hoops Tipoff Marathon, when SDSU showed the rest of the college basketball world what MWC followers already knew: this team is pretty darn good. Perhaps even more impressive for the Aztecs is that their 5-0 record has come entirely on the road thus far, with their first home game scheduled for this Friday when they host San Diego Christian of the NAIA. Kawhi Leonard (Sophomore), San Diego State – It’s very likely that you’ll be seeing either Leonard or Jimmer Fredette’s name in this space most weeks this season. While Fredette’s 25.7 point per game average thus far has certainly left him deserving of this honor this time around, and while Leonard’s Aztec teammate Billy White may have had the biggest single performance of the young season, the nod goes to Kawhi here. He’s led his team in rebounding every night out, never failing to grab double digit boards thus far, he’s averaged 18.8 points per contest, and has even displayed his versatility and ever-improving skill set, pairing three steals with four three-pointers in SDSU’s win over IUPUI on Sunday. Will Clyburn (Junior), Utah – Last year about this time, it was New Mexico’s junior college transfer Darington Hobson who was making a name for himself as a force to be reckoned with in the MWC. A year later, Utah has its own juco transfer making waves around the Rockies. On a Ute roster featuring eight new faces, it is Clyburn’s who has shone most brightly, leading Utah in scoring in each of their three games, averaging 20.7 points and 7.3 rebounds per game, while knocking down five of his 12 attempts behind the arc along the way. Last year’s Lobos were picked to be a middle-of-the-pack team last year before Hobson’s emergence catapulted them to a conference title. For the Utes to entertain similar aspirations, Clyburn will need to keep up his early pace. San Diego State 79, Gonzaga 76 – For only the fifth time in the 82 games in the history of Gonzaga’s McCarthey Athletic Center, a visiting team came in and defeated the Bulldogs on their home court. Behind a career-high 30 points from Aztec senior forward Billy White (on 14-18 shooting and paired with nine rebounds, seven of which came on the offensive end), San Diego State built up a lead as high as ten before hanging on down the stretch and withstanding a similarly outstanding 35-point effort by Zag senior guard Steven Gray to wrap up a big win that will be a feather in the Aztec cap come Selection Sunday. San Diego State (5-0): Aside from the heroics of Billy White and Kawhi Leonard detailed above, the Aztecs have also gotten a big boost from a Santa Clara transfer, sophomore guard James Rahon. Rahon lived up to his reputation as a deadly three-point shooter early in his career in red and black, knocking down three straight threes in the middle of the second half of a tightly contested battle at Long Beach State to break the game open and put the Aztecs on their way to their first win of the season. On the season he is averaging a shade under ten points per night and converting three-point attempts at a sparkling 52.9% clip. Likewise, senior point guard D.J. Gay has shown his leadership abilities, time and again making big plays to spark game-deciding runs for the Aztecs. While Rahon has lived up to his rep as a three-point bomber, Gay has added his own deadly three-point shot to an already strong arsenal, having knocked down 11 of his 22 attempts thus far. If those two can maintain anywhere near that kind of pace, the Aztecs will be looking at a very favorable seed come March, as their imposing frontline has been all that was previously advertised. 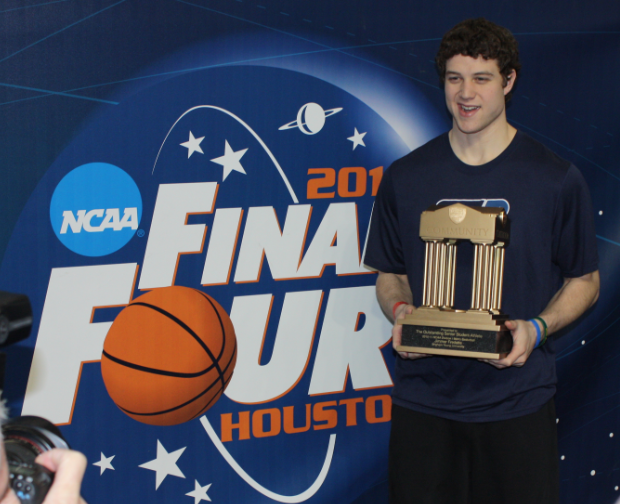 BYU (3-0): Coming into the season, the Cougars pretty much knew what they were going to get from their backcourt tandem of Jimmer Fredette and Jackson Emery. So far, Emery has been off to a slow start, averaging just nine points per game and struggling to find his shooting touch, to the tune of 34.6% from the field and 27.8% from behind the arc. But head coach Dave Rose has no worries about Emery’s game coming around in due time. His concerns prior to the season were with an eye towards the rest of the team, specifically in the front court. In the early going, junior Noah Hartsock and sophomore Chris Collinsworth have done a lot to ease Rose’s mind. Hartsock stepped up immediately, exploding out of his reserve role in the opener to post a career-high 21 points, then backing that up with 15 points and four blocks against Utah State. Collinsworth, for his part, has been rock-solid, averaging seven rebounds per game and throwing in 8.3 points per game, with a high of 15 points in the Cougars blowout of Chicago State. While BYU still has some work to do figuring out all their roles, Hartsock and Collinsworth have already shown that the talent is there. UNLV (3-0): It was a rocky offseason in Sin City, with dismissals, suspensions and injuries scarring the landscape, but three games in, all those rough patches are in the past, with the Rebels having just posted one of the more impressive MWC victories in the early season, a 68-65 victory over visiting Wisconsin. Last year’s leading scorer, senior guard Tre’Von Willis, sat out the first two games of the season (easy wins over second-rate competition) as a result of offseason legal difficulties, before returning in a reserve role against Wisconsin, but it was juniors Chace Stanback and Oscar Bellfield who provided the biggest performances for head coach Lon Kruger in the win over the Badgers. Each player knocked down four threes, with Stanback totaling 25 points and Bellfield notching 18. UNLV’s ability to knock down the three had been a question mark in the lead up to the season, but both players have done their best to answer that query, with Bellfield having hit seven of his 12 attempts (58.3%) and Stanback six of his 15 (40%). While Willis was not a major factor in his return to action, he did hand out five assists in his 23 minutes of play. New Mexico (2-1): The Lobos have faced probably the most consistently tough lineup of games of any MWC in the young season, and perhaps not surprisingly for a young team, have looked pretty strong at home and downright awful in their one road trip. Given that the New Mexico roster is missing junior guard Phillip McDonald due to a partially torn elbow ligament (he is currently day-to-day), is waiting on the services of incoming transfer Drew Gordon (eligible December 17) and is breaking in four new freshmen (including two freshmen starters) and a sophomore transfer, Emmanuel Negedu who, you know, basically died a year ago, I’m not going to ding the Lobos too hard for their 25-point loss at Berkeley, especially considering they looked good in defeating Arizona State at The Pit a few days before that, but Steve Alford and company are definitely having some growing pains in adjusting to life without Darington Hobson and Ramon Martinez. While some difficulty in the non-conference schedule is understandable, the Lobos have a relatively light schedule between now and the end of December when they play in the Las Vegas Classic (a matchup against Colorado and then the winner of Indiana/Northern Iowa), then travel to Texas Tech and Dayton prior to conference play. New Mexico will need to have things straightened out by then, lest they get out of non-conference play with only the Arizona State victory to point to. Colorado State (2-0): For now I’ll stick with the Rams at the number five spot, if only because their season still seems to be a week away. Thus far, the Rams have hosted Arkansas-Pine Bluff and traveled to Denver, posting workmanlike wins each time, with seniors Andy Ogide and Travis Franklin leading the way with almost identical numbers: 17 points, 6.5 rebounds, one assist, and 1.5 steals each in their first two games. The Rams host Sam Houston State on Saturday before their first big test of the season next Wednesday when they host Drake. The soft early schedule has allowed head coach Tim Miles to get a look at plenty of his roster, with 12 players having averaged at least eight minutes per game. In the early season, such a rotation is working out, but the Rams will have to prune the minutes of several players as the year progresses. Utah (3-0): With all the turnover on the Ute roster in the offseason (six players left the program with eligibility remaining, while eight newcomers joined the squad), there were bound to be plenty of questions about this team’s ability to win. Three games in, Jim Boylen’s squad has at least proven itself capable of winning games at home against teams it is supposed to beat. Along the way, Boylen has had some of his fresh blood step up and announce that they are ready to play, with Will Clyburn, our newcomer of the week, leading the way. Elsewhere, junior college transfer Josh Watkins has taken over the point guard position without skipping a beat, averaging 15.7 points and five assists per game, while holdovers Jay Watkins and Jason Washburn have been solid in the frontcourt. While it remains to be seen if this year’s cast has the talent that last year’s underachievers did, it seems clear that this will be a more consistent and hard-working bunch than last season’s neurotic cast-offs. TCU (3-2): This year’s early MWC candidate for team most in need of psychiatric treatment is the Horned Frogs. Five games in, this looks like a team capable of wild mood swings, capable of wrapping a 20-point victory over cross-town rival SMU and a six-point neutral-site win over a good Bradley team around a stinker of a 15-point loss against Rider. The Frogs are going to be exciting at times, with their mighty-mite backcourt of 6’2 Ronnie Moss and 5’9 Hank Thorns. Thorns, a transfer from Virginia Tech in his first year of eligibility in Fort Worth, has led the team in assists in four of their first five games, and in three of those four games, he dropped ten dimes. Moss, for his part, has looked excellent playing off the ball, scoring in double figures in all five TCU games, while hitting 45% from the field and 41% from deep. The frontcourt is undersized, but 6’6 wing Garlon Green and a pair of junior college transfers, 6’5 J.R. Cadot and 6’4 Sammy Yeager, have all shown a willingness to help out on the glass. They’ll need to keep that up and get some help from more traditional frontcourt players for the Frogs to contend in a tough conference. Wyoming (2-2): There had been some talk that last year’s underachieving season for the Cowboys was as much a reflection of some bad luck with injuries as it was with some inherent problems with the makeup of the team. Four games into the season, and with a pair of one-game suspensions for primary offensive weapons Afam Muojeke and Desmar Jackson already in the rearview mirror, with a starting lineup that remains in a state of flux, with a team that consistently racks up more turnovers than it does assists, and with the resultant losses to North Florida and Northern Colorado (the first time in 21 games since 1937 that Northern Colorado has beaten Wyoming) in the record books, it’s time to face the facts that this team just isn’t very good, that head coach Heath Schroyer is just not working out and that the Wyoming basketball program is in need of a reboot. Unfortunately, that reboot is still probably four months away. Air Force (2-1): As bad as the state of the Wyoming program is, they haven’t lost to a D-III school yet. The same cannot be said of the Falcons, who dropped an overtime affair with Colorado College last Wednesday. They were able to take care of Tennessee State and the University of Colorado at Colorado Springs, but there is simply not enough talent on this roster for this team to be competitive. Players like versatile senior Evan Washington, senior forward Tom Fow and sophomore guard Michael Lyons are good hardworking kids, but this year’s edition of the Falcons are more suited to the Big Sky level of talent than the Mountain West. Head coach Jeff Reynolds will get the most out of this roster, but for him to be comfortable as the head coach at the Academy, he’ll need to recruit a higher level of talent. While the battle in the Beehive State may be the game of the week, Utah will follow that up with another interesting game when they host Oral Roberts on Saturday. There are also plenty of other interesting events around the conference as three other MWC teams compete in early season tournaments. UNLV plays in the most high-profile of the three when they compete in the 76 Classic (opening round game against Tulsa, either Murray State or Stanford in the next round and a potential matchup with Virginia Tech in the final), but BYU will play in the South Padre Island Invitational (against South Florida and then either St. Mary’s or Texas Tech) and Wyoming will get beat down by Missouri in the Cancun Challenge before advancing to likely lose to either Providence or La Salle.